Home > Ask Our Experts > What is the Cause of my Itchy Eye? Q.One of my eyes itches in the corner near the tear duct. There is no redness or other signs of a problem in that area or the rest of the eye. My eyesight is fine although I have used contact lenses for years with no problems. I have been using a swimming pool and wonder if I am allergic to chlorine? I had this problem at the same time last year when it lasted for a couple of months then was OK. I tried taking anti histamine tablets but they didn't help. Because you have tried taking anti-histamines and they haven’t helped I would suggest that your itching is not related to hay fever or other allergic symptoms.In my opinion it is more likely that you have the beginning of an eye-infection such as conjunctivitis. Although you say that there is no redness there could still be a small infection developing in the area. It is also possible that you are suffering from dry eyes which can be caused by outside factors such as the weather, the central heating or environment but also from wearing contact lenses. During flare-ups of dry eyes the tear ducts (lachrymal ducts) do not produce enough of the fluid needed to keep our eye hydrated or the tears that are produced are drying up too quickly. This fluid is vital as contains substances such as proteins, fatty matter and cells that help keep infections away. They are also important for allowing us to see clearly and blink comfortably. As you are a contact lens wearer this indicates that you are at risk of developing dry eyes. Have you been using the same types of contact lens for many years? Newer forms of lens have been created in recent years that are more permeable and allow the fluid of the eyes to penetrate behind the lens keeping them hydrated more efficiently than older types of lens. For many of us this condition is not dangerous and it is actually quite common and many of us will suffer from dry eyes at some point in our life time. For a few people there may be a small risk of having as serious associated condition which will need professional diagnosis and assessment. For most people the condition can be overcome by using eye drops which can be bought cheaply from your optician, local pharmacy and can even be found in some supermarkets. If you feel that there is a reason behind your itchy eyes, why not go and book an eye test to put your mind at rest? You do not say whether you are taking any medications as sometimes these can have side-effects that affect other areas of your body and the eyes may be affected by some medications.Your eyes are very special and deserve the best possible care and attention so if I were you, just to make sure I would make an appointment with your optician and have an informal chat about your concerns. I have One and only One itchy eye that has been going on 24/7 for 5 weeks.Eye is not swollen vision not affected. Eye doc said no pathology going on in eye. Saw dermatologist. He gave me doxycycline and sulphur face wash for mild dermatitis but did not say what is causing eye itch. Could one eye be affected by dermatitis or other skin condition.? Paragraph from one of your answer columns below "It is also possible that you are suffering from dry eyes which can be caused by outside factors such as the weather, the central heating or environment but also from wearing contact lenses. During flare-ups of dry eyes the tear ducts (lachrymal ducts) do not produce enough of the fluid needed to keep our eye hydrated or the tears that are produced are drying up too quickly". Tear ducts do not produce tears. The lacrimal glands do - they are paired almond-shaped glands, one for each eye, that secrete the aqueous layer of the tear film. They are situated in the upper, outer portion of each orbit, not the corner of the eye. 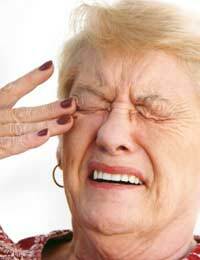 I have this problem of itchy tear ducts possibly caused by blocked or inflamed tear ducts. This answer will not help anybody with these symptoms.